Abu Dhabi: For the safety of children, a total of 150 taxis in Abu Dhabi currently have the option of providing child seats during the ride, the capital’s transport regulatory authority has said. 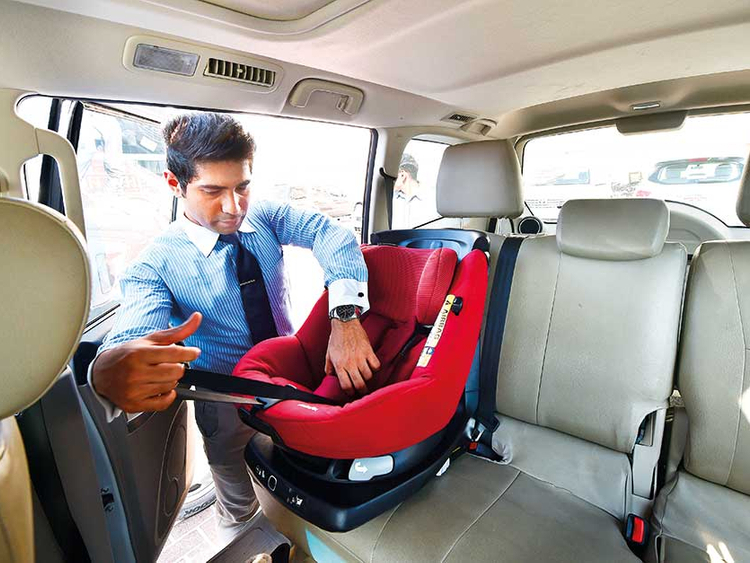 The Department of Municipal Affairs and Transport’s Integrated Transport Centre (ITC) is studying the need for more child safety seats and this number may even increase in the near future, the ITC told Gulf News. The ITC was responding to queries about the availability of child car seats in taxis following a new set of regulations that came into effect this month. The law mandates that children four years and younger must be strapped into child car seats, with a Dh400 fine for violators. Children aged 10 years and younger are also prohibited from travelling in the front seat. As Gulf News reported last week, commuters in the capital have been in a state of confusion about how the regulations apply to taxis. The ITC currently operates more than 7,640 taxis in the capital, and to ride one with a car seat, commuters need to book ahead through the call centre or the smartphone application. “In order to ensure their own safety, we urge all passengers to plan their rides. And [in case a car seat is not available, we advise parents to make sure that their children ride in the back seat, and that the seat belt is fastened for older children,” the ITC said. Many parents insist that the ITC should provide child safety seats in taxis to ensure the safety of young passengers. Other parents say they can themselves carry a car seat while hailing a cab, but it can be highly inconvenient and difficult. “Booking a taxi in advance is not always a suitable option, especially when you need to travel in emergency with a toddler. Sometimes, the booked taxi never arrives. At other times, taxis cannot get to busy areas on time. Given that these situations occur, the authorities should furnish more taxis with child car seats,” said Jasmine A, a 26-year-old homemaker from India. Jasmine says she has to travel in taxis with her two-year-old daughter as the family does not own a car. Gemma Wills, a 35-year-old teacher and mother-of-three from the United Kingdom, said many of her friends had also complained about the lack of taxis with child safety seats. “I personally haven’t used a taxi with my children, but friends who have [tried say that] you cannot book [a taxi with a car seat] in advance. They also say that seats for newborn babies are never available,” she said. Wills said that parents can easily carry car seats for infants for riding a taxi, but this is not convenient with the bulkier seats for toddlers and young children. “It should be the taxi company’s responsibility to provide car seats for the children,” she said. While child car seats are mandatory in many European countries, Canada, Australia and the United States, most transport authorities exempt taxis from it. However, in Germany and some US states like California, parents must book a taxi with a child car seat or carry their own while hailing a taxi. Dubai’s Roads and Transport Authority also announced last week that all taxi franchise companies and limousine services will have to make child car seats available to passengers.